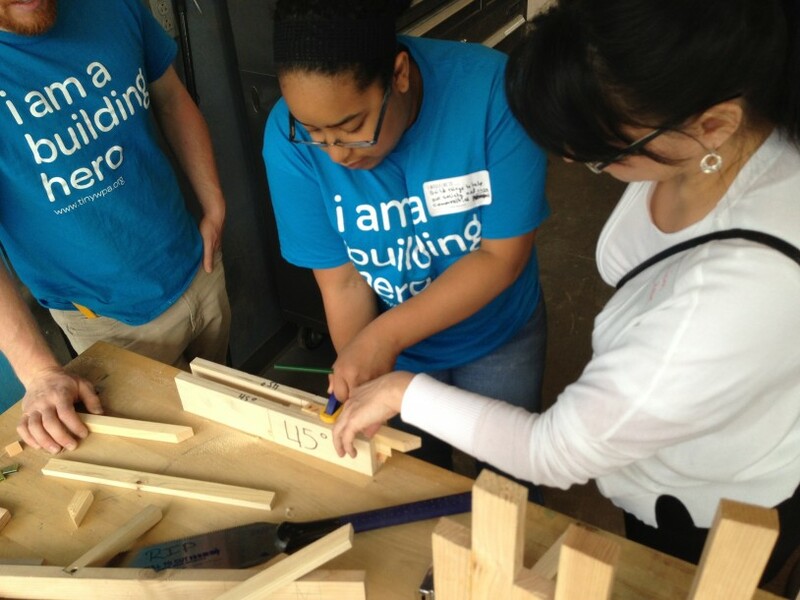 ”Building Hero’ Is Not A Title You Are Given, It’s Something That You Earn.’~Alexa E., Age 16. 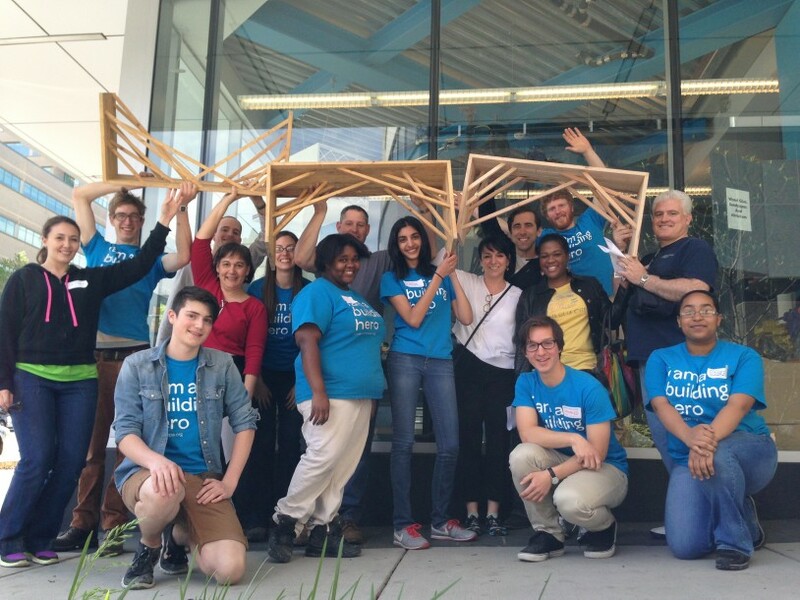 Regularly, one of the members of The Building Hero Project, our community design leadership program in Philadelphia, will be reflecting upon and sharing their experiences in the program. 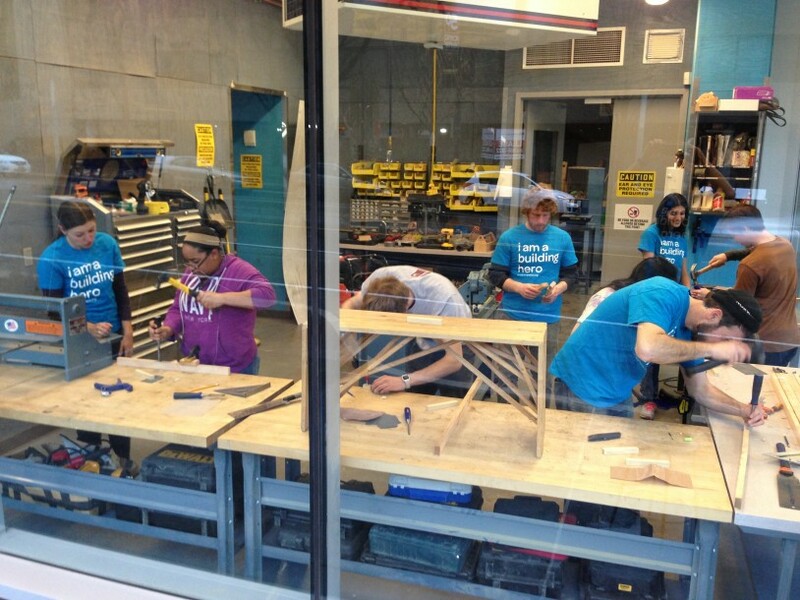 This week, Alexa E., a 16 year old building hero from the Science Leadership Academy writes about the bench building workshop she helped lead for Leadership Philadelphia visit last weekend. I’m not a person who really “gets out there”. I’m not an out there person, I’m a shy person. I’m not really a person to take charge, I like to spend time alone. That all changed when I became a building hero. All of a sudden I am out there, I am an out there person, and I am taking charge. 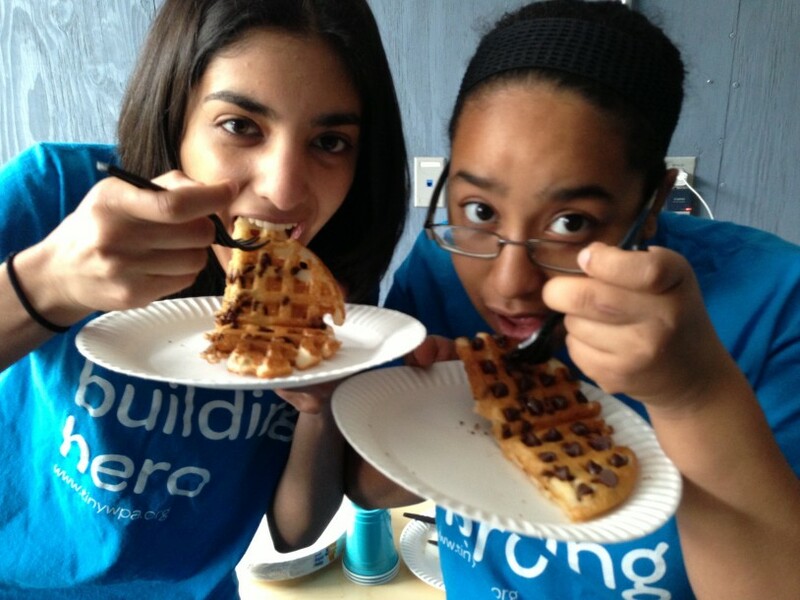 A “building hero” is not just a title you are given when you join a TinyWPA project, it’s something that you earn. Something that you achieve through honest hard work. How did I start? I was introduced. Sitting there, I was a little shy, maybe feeling awkward, maybe I didn’t want to be there. Then I met my group at our workshop. Every Sunday we meet up and talk about kick starting or how to make our benches better. Everyone works together and it’s just so fun that sometimes I don’t want to leave. Once I got accustomed to it, it was just like walking straight into home and into routine. We started on building our benches. Each one hand made and unique, no two ever the same. I was proud when I put together my first part of the bench. 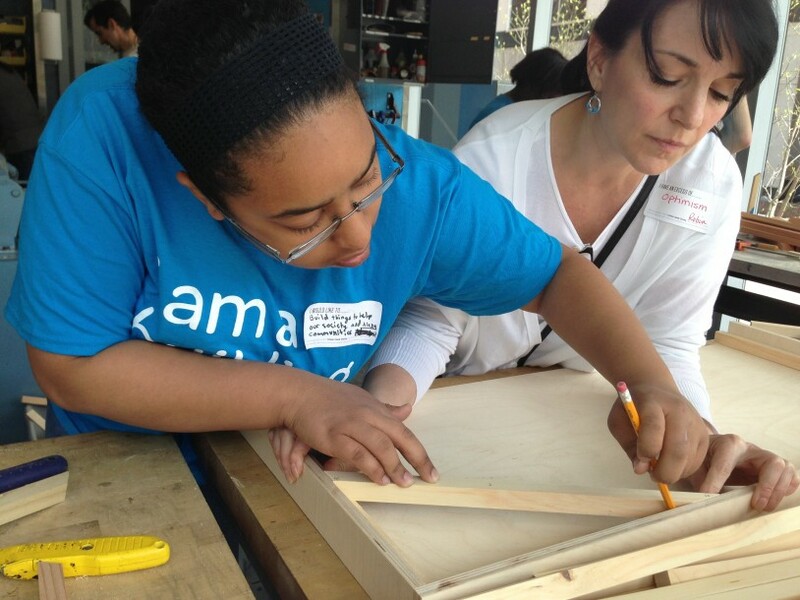 I never used a drill, or a saw, or a jig (a tool which helps you cut perfect angles in wood) before. It was nice to expand my horizons! Last Saturday on 4/20/13 we had ten visitors from Leadership Philadelphia at our little workplace, The Department of Making + Doing at 3711 Market St. Of the people that I worked with, one was a cop, one worked for Comcast, and another was a lawyer. It was great because they stepped out of their comfort zones to step into our little world of wonders. Learning how to use their hands to create something wonderful, something that takes a lot of time, love, and care. I was proud because, they came to learn from me, just a sophmore in highschool. 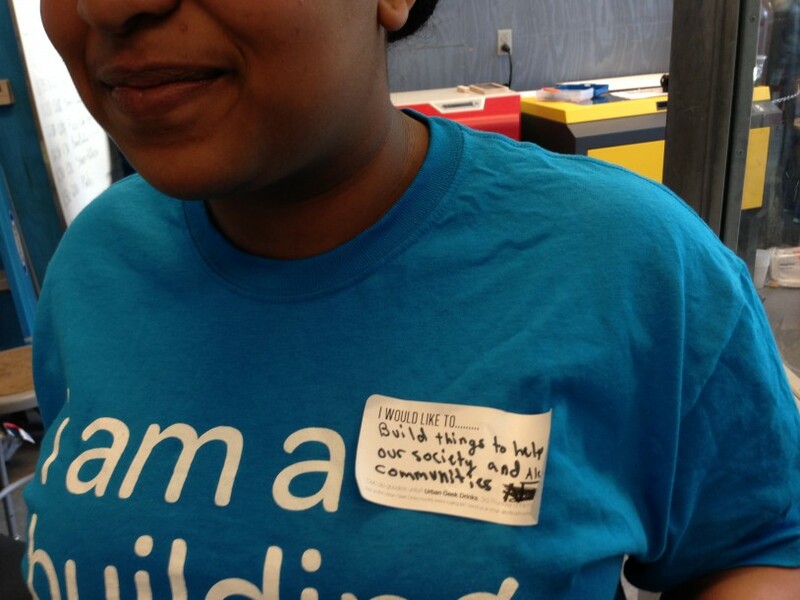 They learned what it was like to be a building hero, and why I’m so proud at what I do. We just don’t build things to sell, we build things to take a step forward to the future and make things better. We are the people who dispell the broken window effect, we are the people who say “There’s an empty lot? Why not make it into a park?”, and we are the people who never say “We can’t”. We are building heroes. Are you?